Greetings from Heathrow Airport, where I am having my first encounter with the wonders of Business Class travel. It was an excruciating flight across the pond. 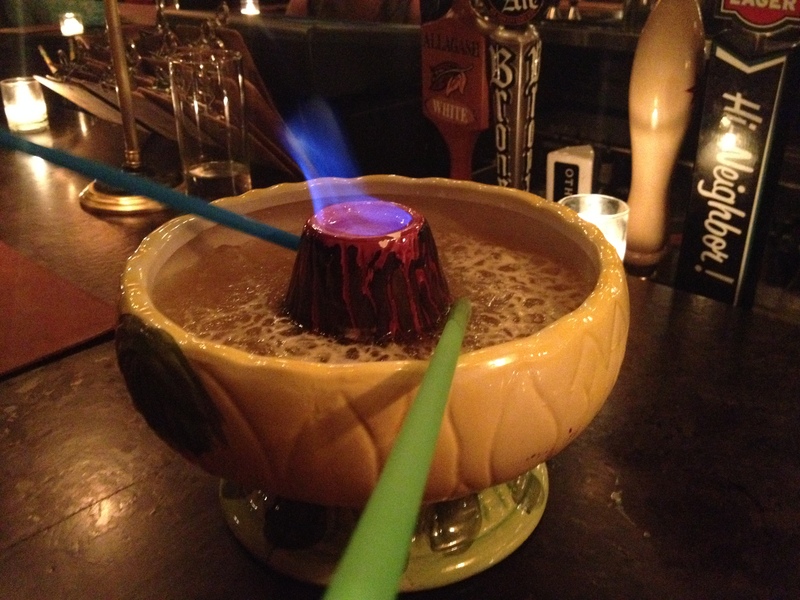 Sheer exhaustion, a couple of stiff cocktails and Led Zeppelin IV enabled me to sleep through takeoff and the first hour of flight. But that left me with seven hours in which to watch mediocre movies, obsess about my physical discomfort, and make frequent trips to the restroom so as not to feel trapped. A travel mishap found my stepdad ponying up some of his precious miles to ensure that I made it to Paris in time to start a two-week study trip. It seems that steerage was all booked, so I will be flying Business Class for the second (and, sadly, much shorter) leg of my travel. I knew this meant a bigger seat and complimentary on-board cocktails, but had no idea about the perks at the airport. The transfer between terminals involved approximately a mile of walking and a 15-minute bus ride through the back end of the airport. I arrived at the Air France counter tired, hungry and more than a bit cranky. The woman I handed my passport to didn’t appear any happier–until, that is, she pulled up my name and discovered that I was (for this brief moment in time) a member of the elite. Within minutes, I was stepping through the discrete frosted doors of the Sky Club where they greeted me warmly and booked me for a complimentary facial. I had debated grabbing coffee and a lackluster baked good in the terminal, but it turns out there’s a full buffet breakfast, an espresso machine, and Bloody Mary fixings here in the Sky Lounge. There are sleek and clean bathrooms, all manner of comfy chairs, and a wall of moss, ferns and ivy that is doing wonders for my respiratory system. Having knocked back a latte, a cappuccino, two glasses of cucumber-infused water, half a Bloody Mary, and a proper English breakfast (beans! 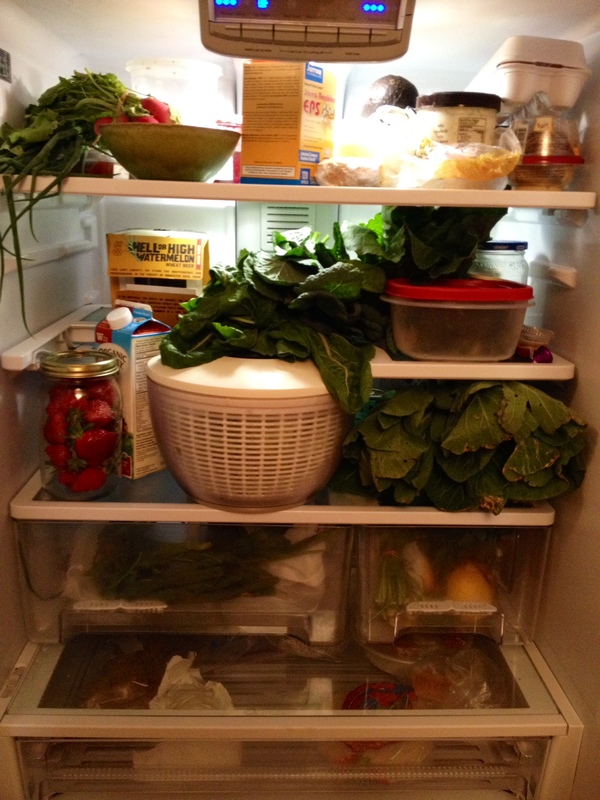 ), I thought I’d take a little time to update you, dear reader, on my progress on that fridge full of fresh produce. As previously reported, Saturday started with a Greek-Style Kale Salad. 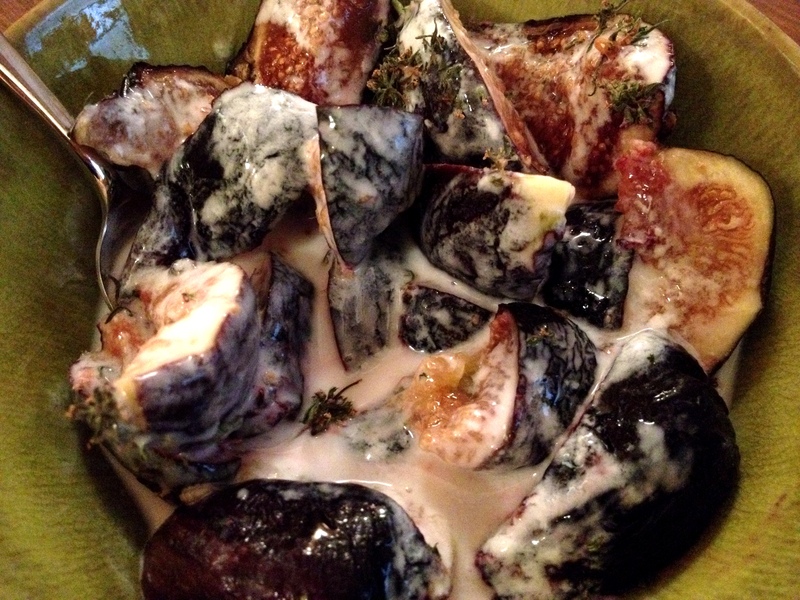 For my midday meal, I topped the slightly-past-their-prime figs with more of the goat milk yogurt and some flowering thyme. I spent the afternoon running errands while some ribs left from last season’s Lewis Waite Farm Carnivore Share spent their time marinating in preparation for a farewell feast. Louis arrived a little after 8:00 bearing Prosecco, Chardonnay and a Zinfadel that, I am ashamed to confess, we did not even crack. 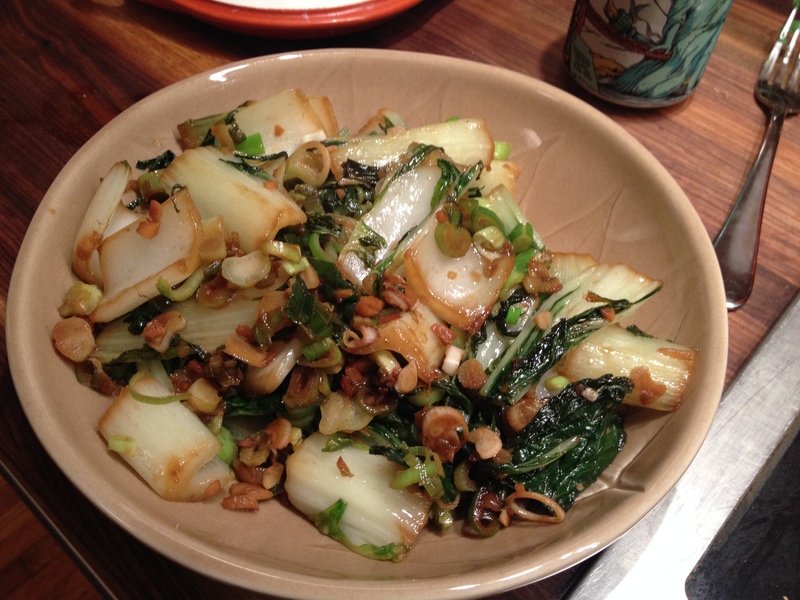 By 8:30 we were sitting down to a delightful meal of five-spice spare ribs, stir-fried bok choy with scallions, and rice cooked with ginger and shiitake mushrooms. Cut the rack into individual ribs by running a knife between the bones. 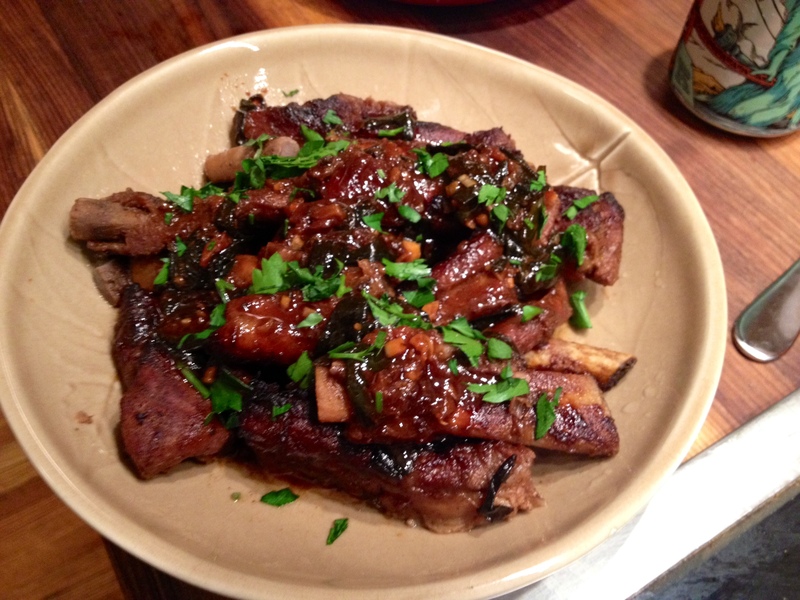 Combine the rest of the ingredients in a shallow baking dish and submerge the ribs in this marinade. Cover with plastic wrap and let sit in the refrigerator for at least eight hours, flipping the ribs to ensure even penetration. Pre-heat oven to 325, remove plastic wrap, tent ribs with foil and pop in the oven. Let cook for one hour, then remove the foil, flip the ribs, and let cook for another hour. At this point, your marinade should be starting to thicken. Remove the ribs to a covered serving dish to keep warm. Pour the marinade into a small container and simmer on the stove top until it is the consistency of barbecue sauce. Drizzle this over the ribs and serve. 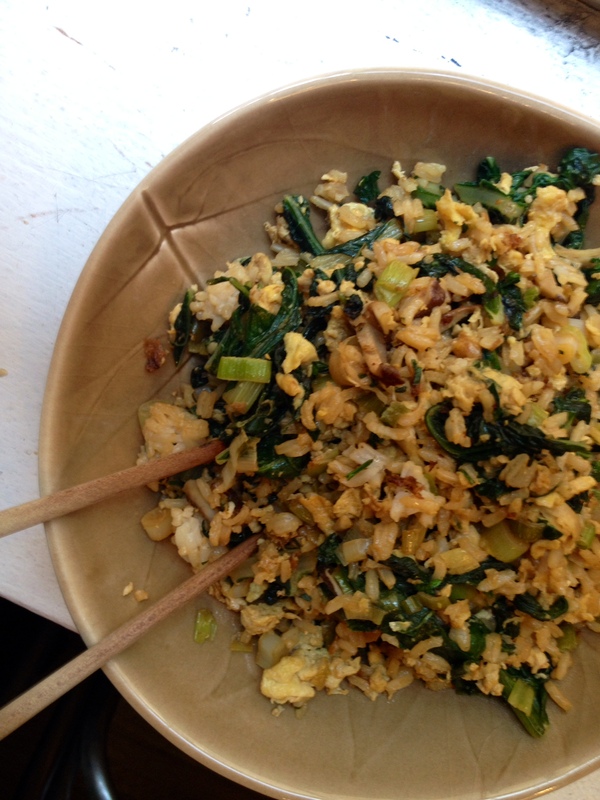 The next morning I converted the leftover rice into fried rice with swiss chard, scallions and egg. 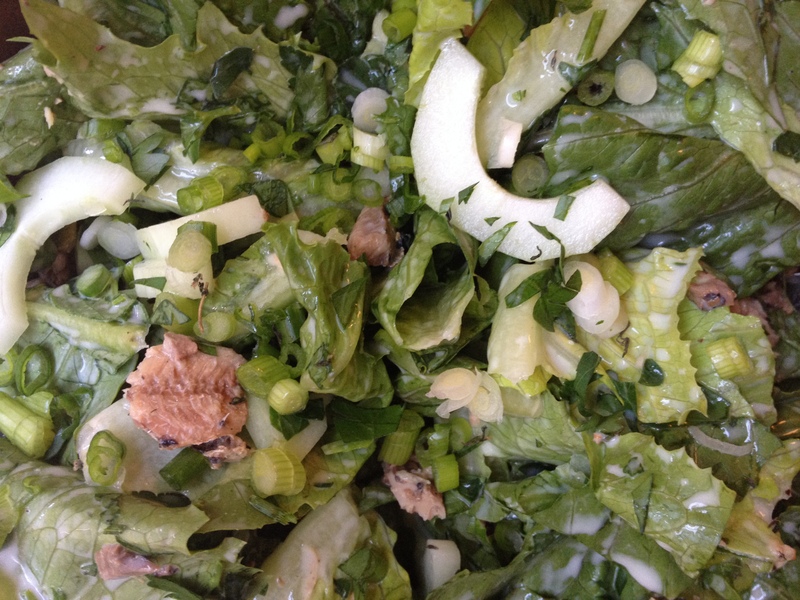 Later that afternoon, I polished off a head of romaine, half a cucumber that had been hiding in the crisper and the rest of the scallions with a dressing made from the last of the goat milk yogurt, garlic scapes and whatever fresh herbs I still had on hand. 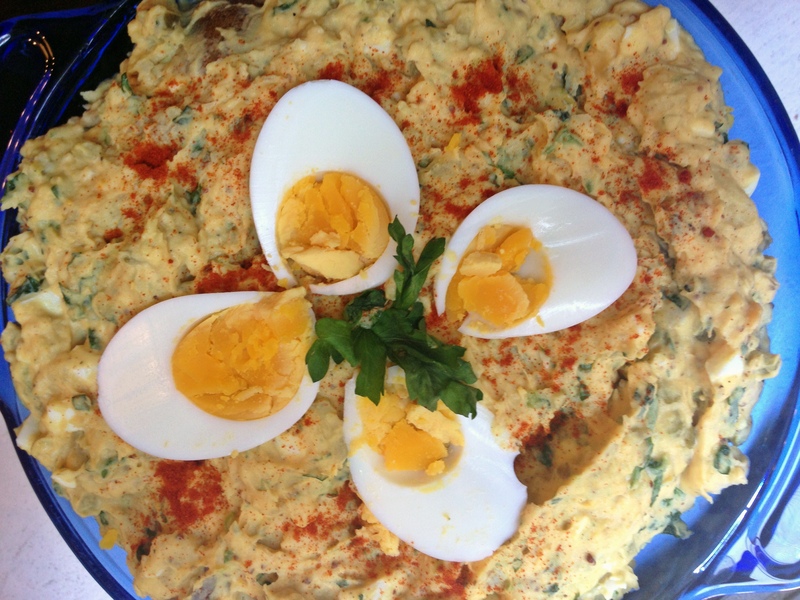 Some canned sardines–stockpiled for just such a purpose–rounded out the meal. 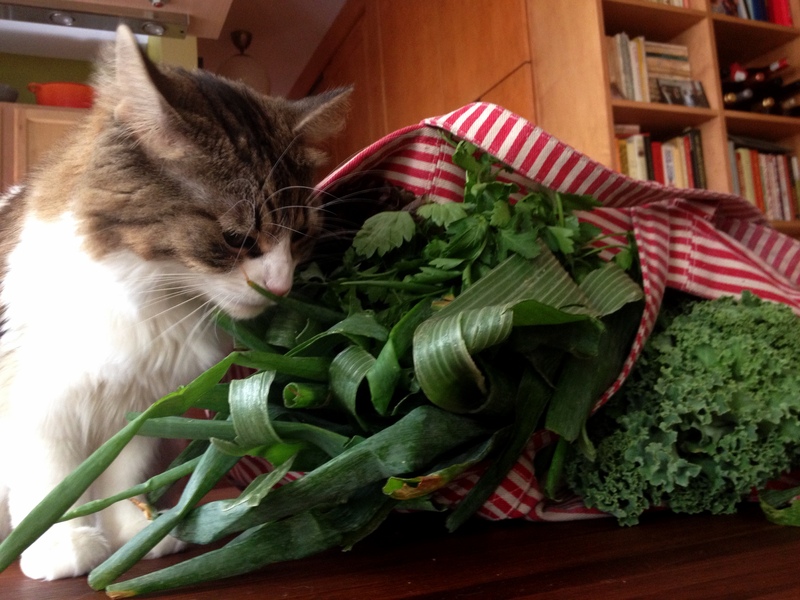 Just before leaving for the airport, I admitted defeat and delivered one last bunch of kale to my neighbors. No vegetables get left behind! OK, best be off for my pre-flight facial before they figure out that I’m an imposter. This not the refrigerator of someone about to leave the country for two weeks. I am weak in the face of the season’s bounty. Having already overbought at last Saturday’s greenmarket, Tuesday found me dashing home to Brooklyn after work to collect my first CSA share of the season before hopping a train back into the city for four hours (seriously) of Alison Krauss and Willie Nelson at Radio City Music Hall. I’ve done my best to eat my way through all of these vegetables, but that’s a tall order when you’re pulling a 60-hour week. 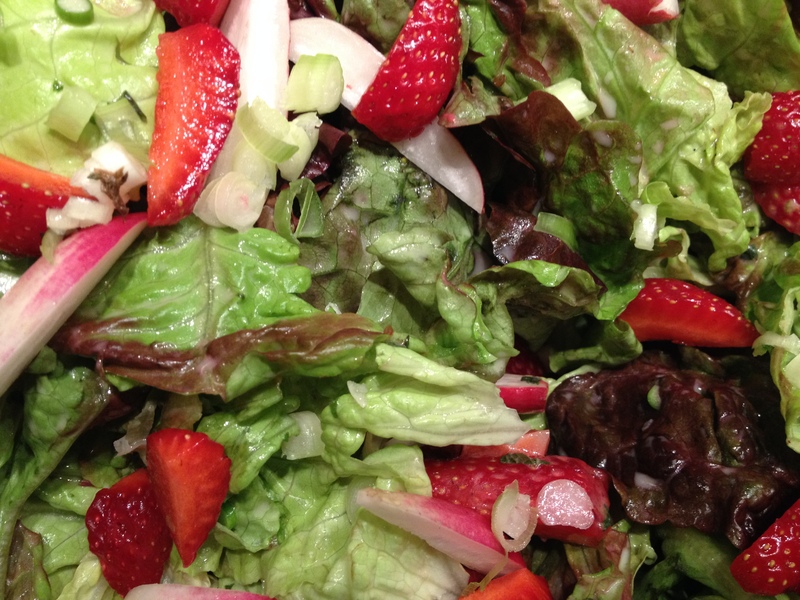 Late Wednesday I made myself a salad of red leaf lettuce, radishes, strawberries, scallions and fresh herbs. This was damn pretty, but didn’t quite come together flavor-wise. Had I to do it over again, I’d eliminate the radishes and let some of the strawberries macerate in the dressing for a bit before assembling the salad. Thursday night found me at yet another work event. I wrapped my week and celebrated the beginning of a much-needed two-week vacation with swanky hotel bar cocktails and some down and dirty Indian food. I awoke this morning determined to get through my stockpile of vegetables in the 32 hours before my departure for the airport. Noting that I still had almost a full pint of luscious (and decidedly not cheap) goat milk yogurt, I started the day with this Greek-inspired kale salad. 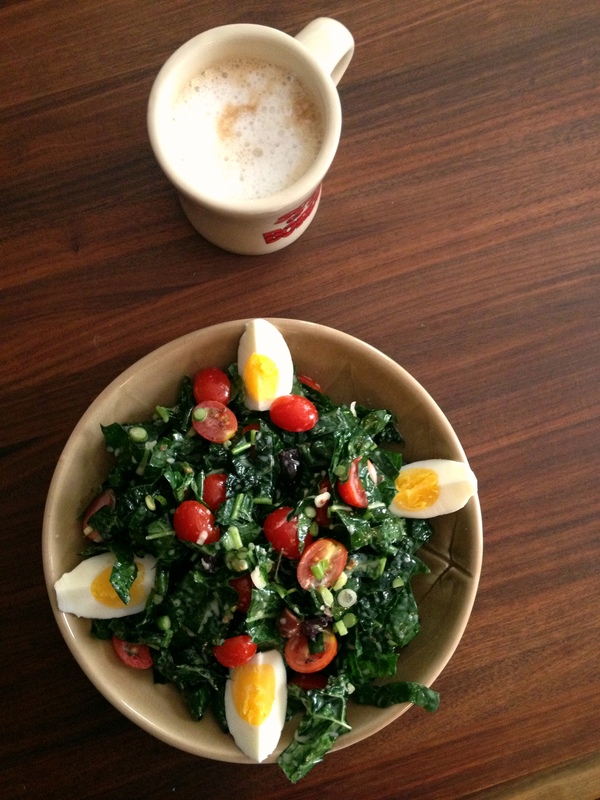 A latte and a hard-boiled egg left over from last weekend’s potato salad extravaganza made it breakfast. Combine the first seven ingredient in a small jar, shake vigorously and let sit while you prep the rest of the ingredients. Add the olive oil and give it another good shake. Add everything to a bowl, toss to combine and let sit for 15 minutes or so until kale begins to wilt and take on a glossy color. Those ill-fated radishes would have been great here, as would a little sliced cucumber. But it was still a damn tasty breakfast. 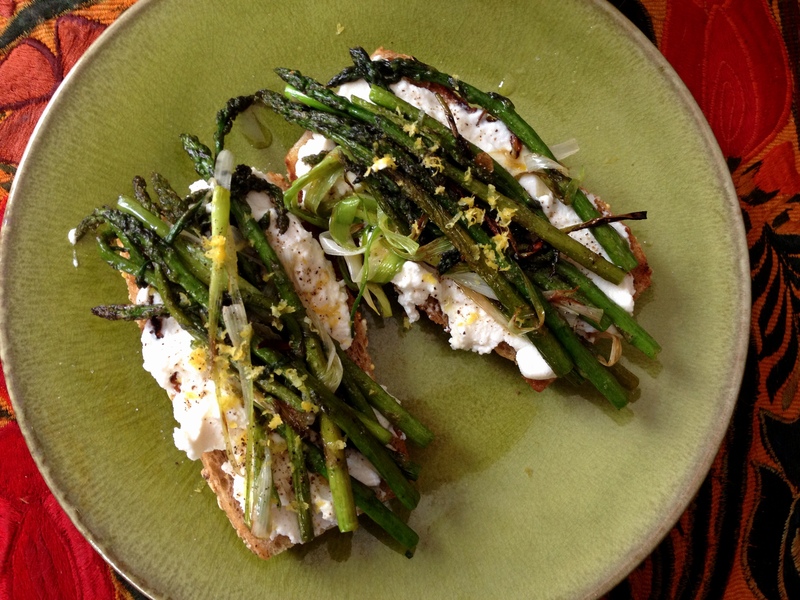 Top toasted whole grain bread with ricotta cheese, pan-grilled scallions and asparagus, lemon zest, salt and pepper for a quick and delicious breakfast when you’re eager to get out and smell the roses (literally if, like me, you’re lucky enough to live five minutes from the Brooklyn Botanic Garden). 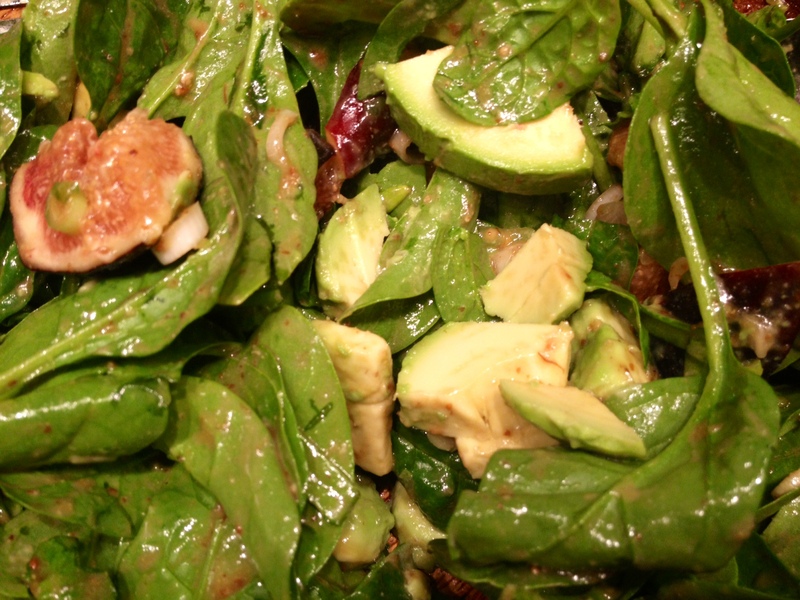 Figs, avocado, scallions and baby spinach in a mustard, honey, safflower oil and apple cider vinaigrette can be prepared and consumed in the 20 minutes between your arrival home from a board meeting and your 9:00pm conference call–though you may find yourself in need of a square of Jacques Torres’ Gingerette Bar to help everything settle. I spent the latter half of the week upstate on a staff retreat. I knew the food at Omega Institute would be healthy and restorative after the previous weekend’s barbecue and boozefest. But I had no clue how delicious it would be. Each meal featured a bounty of cooked and raw vegetables, whole grains, legumes and some of the best tofu and seitan dishes I’d had since my hippie childhood amidst the Illinois cornfields. Ordinarily, despite my best intentions, I max out at a single plate of food. At Omega, I found myself going back for a second round of fresh, locally grown pea shoots with an addictive mustard miso dressing. Aside from the fifth of Bulleit Bourbon that I smuggled in for a little late night unwinding back in my cabin, it was three days of clean living. The trip back to the city was gruesome. It took us about three hours to travel the 20 miles from the Northern Bronx to Downtown Brooklyn. You can spend three days on a staff retreat in the woods, but the true team building comes when you’re stuck in a minivan during summer Friday traffic. The rental wasn’t due back until the next day and I had high hopes of using it for a little adventure dining and perhaps an errand or two. But by the time I dropped everyone at their various subways stops and made it back to my neighborhood, I had resolved to ditch the van back at its garage. My friend Molly, who had flown in from San Francisco for a work conference earlier in the week, was waiting at the bar around the corner from my house. I texted her that I’d be there in five minutes. Being a true friend, her reply was simple: “red or white?” Three glasses of a lovely Sauvignon Blanc and a terrine of chicken liver mousse were a fine reintroduction to urban living. Yesterday we bummed around Brooklyn, as I showed Molly the radical changes that have transpired since we first met here 17 years ago. We grabbed coffee at one of the ten or so coffee shops that now dot the neighborhood. We hit up the Grand Army Plaza Greenmarket, where I picked up asparagus, scallions, shiitake mushrooms, eggs, spinach, fresh thyme, bacon ends and some whole wheat sourdough. We walked over to Clinton Hill for a little flea market browsing followed by white sangria and a snack of lamb meatballs and spicy goat cheese croquettes. Later that night we dined on fiddlehead ferns, orecchiette with flowering mustard greens, and pork shoulder infused with rosemary at a place I’m pretty sure used to serve chicken wings and General Tso’s chicken from behind bulletproof glass. Today’s portion of the neighborhood tour focused on gardens of both the botanic and beer varieties. Two hours ago I loaded Molly and her suitcases into a Town Car with the requisite cracked leather seats and pine tree-shaped air freshener. (Not everything about Brooklyn has changed.) 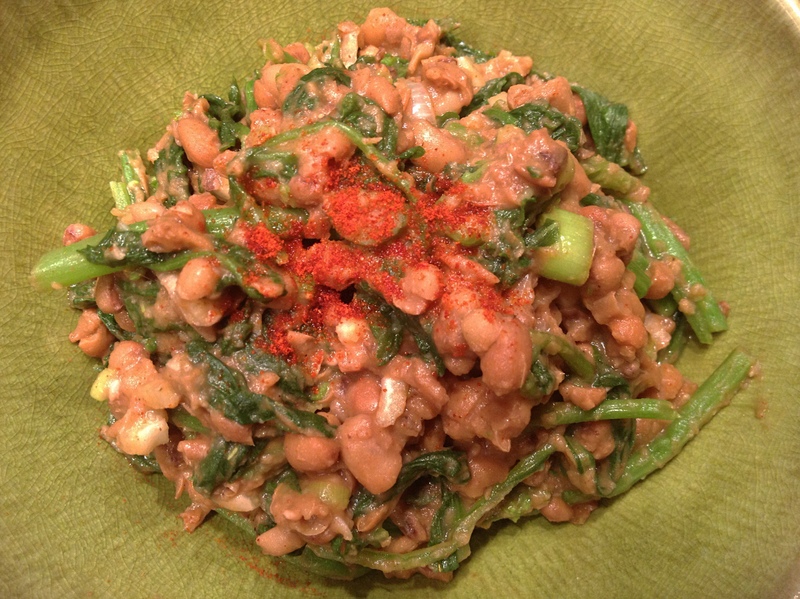 I am now indulging in a little Sunday night melancholia–and this delicious bean salad, which was inspired by a dish that my neighbor and fellow blogger whipped up for a potluck a few months back. Check him out at Brooklyn Roof Garden. Add the peas to a medium pot and run water until it comes up a couple of inches above the peas. Add the butter, bring to a boil, reduce to a simmer and cook for 40 minutes or so until they are just tender. Add a teaspoon of salt and simmer another 10-20 minutes until the beans are nice and soft but not yet falling apart. Turn off the heat and let sit. Add 1/2 inch of water and a large pinch of salt to a large pot. 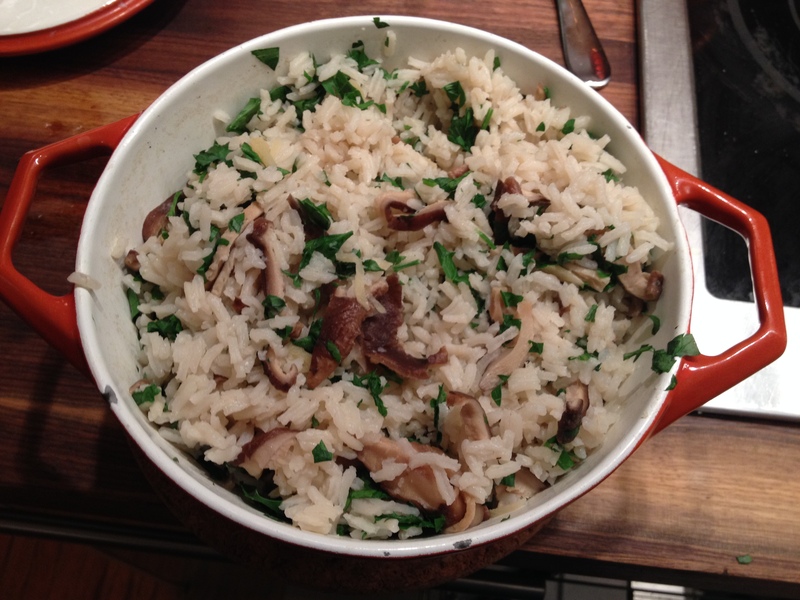 Bring to a boil and then add the broccoli rabe. Cook with the lid on, stirring occasionally, for 3-8 minutes depending on the thickness of your stalks. You’re going for an ever-so-slightly al dente texture. Pour into a strainer and rinse with cold water to stop the cooking process. Stir the celery, scallions, vinegar, oil, paprika and a good bit of black pepper into the beans. Squeeze any excess water from the broccoli rabe and mix this in as well. Taste and adjust the seasoning with additional salt, pepper, paprika or vinegar as you see fit. As you can see, my field peas got a little mushy. They were still quite tasty but, if you have the time, I recommend soaking the dried beans the night before. 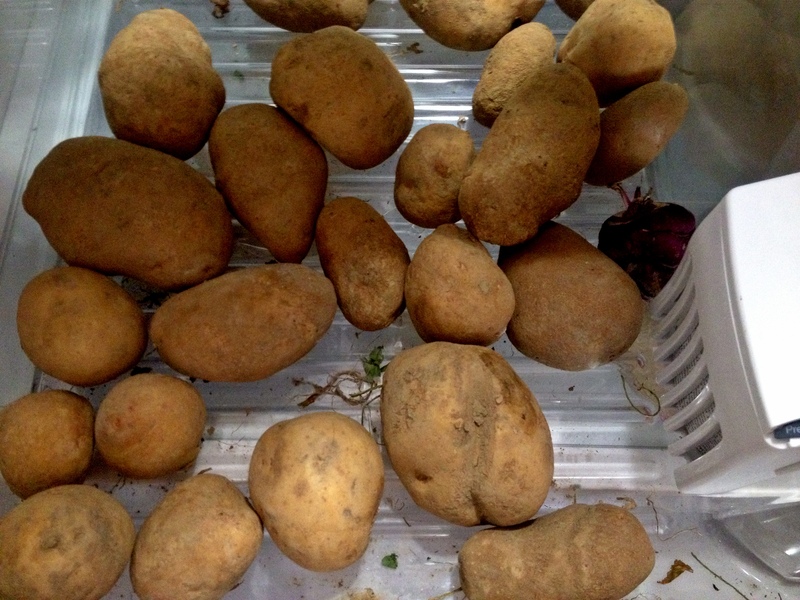 This will help them to retain their shape and also cut down on cooking time. I used this technique a few weeks ago and the resulting dish was a bit more photogenic, particularly when served alongside marinated and grilled flank steak. Tonight I went for a more humble approach to dinner.